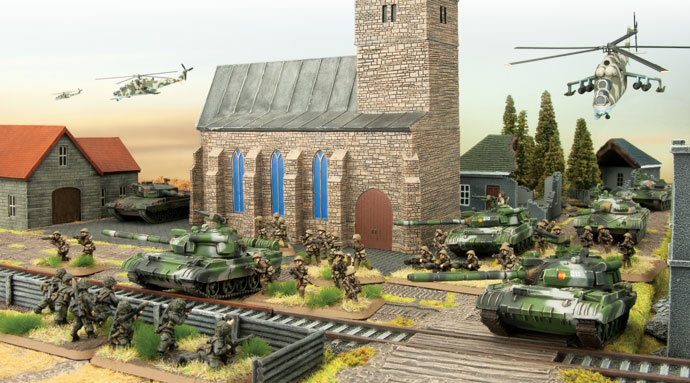 Earlier this year we released the much-anticipated plastic T-54/T-55 tank, one of the most widely used tanks in the world. 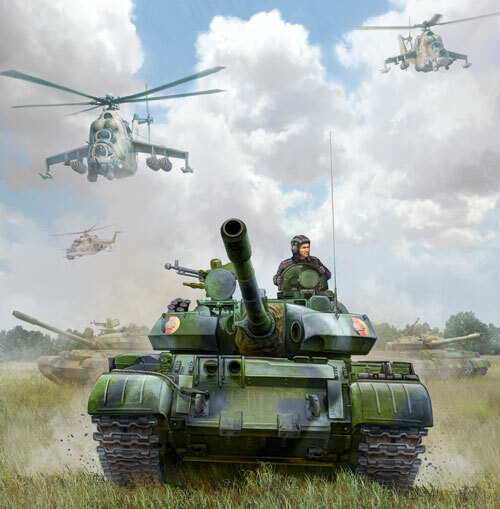 In Team Yankee you can currently field the T-55AM2 variant with your East German forces in Volksarmee, or the T-54 with your NVA (North Vietnamese Army) in ‘Nam, and very shortly the Syrians and Egyptians in Fate Of A Nation. 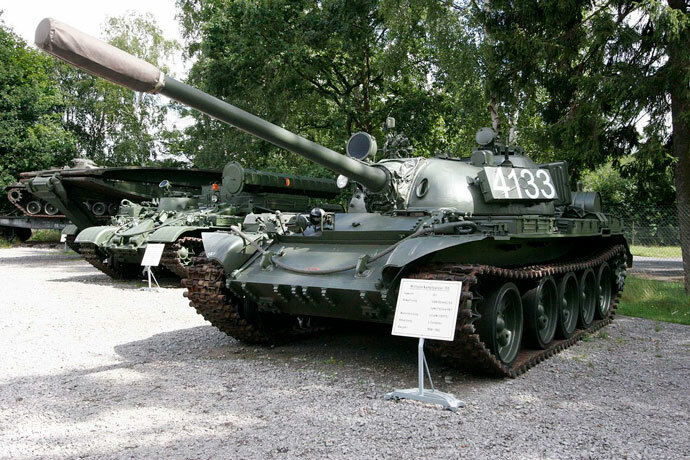 The T-54 and T-55 tanks were a result of the continuing development process for the T-34 (and T-44) during the closing years of World War II. A series of developments and improvements saw the design go into production in the late 1940’s. Over the intervening years the T-54/T-55 would be continuously updated and upgraded with improved engines, NBC (Nuclear, Biological, Chemical) protection, sights, radios and so on. From a Team Yankee in-game perspective, the majority of these changes had very little or no impact however in the late 1970’s operators began upgrading some of their tanks to the new T-55AM version. From an external perspective there are some very obvious ways to tell the two models apart. The modernised AM tanks have (in my opinion) a very interesting looking turret as the addition of BDD armour adds extra bulges around the cheeks, whilst the laser rangefinder above the gun barrel adds another very visible element. The hull has also seen some additions which make the two versions easy to tell apart, first up the front of the hull comes out a little further due to the addition of extra armour and rubber skirts have been added to the side of the hull to provide protection from RPGs (and similar weapons) after experiences in Afghanistan. Below you can see a couple of pictures of a T-55 and T-55AM2 at Panzermuseum Munster (the German Tank Museum in Munster). 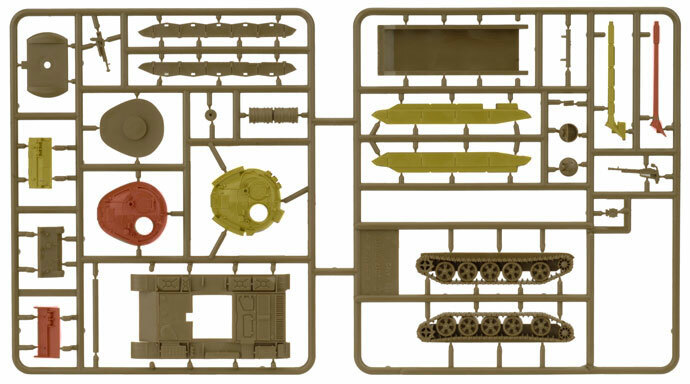 Below you can see our T-55 plastic sprue and I’ve highlighted the hull front or glacis plate, turret tops, skirts (for the T-55AM2) and gun barrels so you can see the differences. Highlighted in red are the T-55 components, whilst highlighted in yellow are the T-55AM2 specific pieces. So What Do These Differences Mean In Team Yankee? The front armour improves from 13 to 14, whilst the side and top armour stay the same. The T-55AM2 has picked up Bazooka Skirts giving it side armour 10 vs HEAT weapons. This isn’t a massive improvement over the native 9 but when the American made LAW (which almost every US infantry team has) is AT 12, even 1 point makes a difference. We also see that the AM2 variant picks up one additional AT on it’s main gun, going from 16 to 17. This is more about the difference between the two time periods rather than any upgrade to the tank itself. The ‘Nam versions are firing older generations of 100mm gun rounds (from the 60’s and 70’s), whereas the East Germans have access to more modern ammunition. 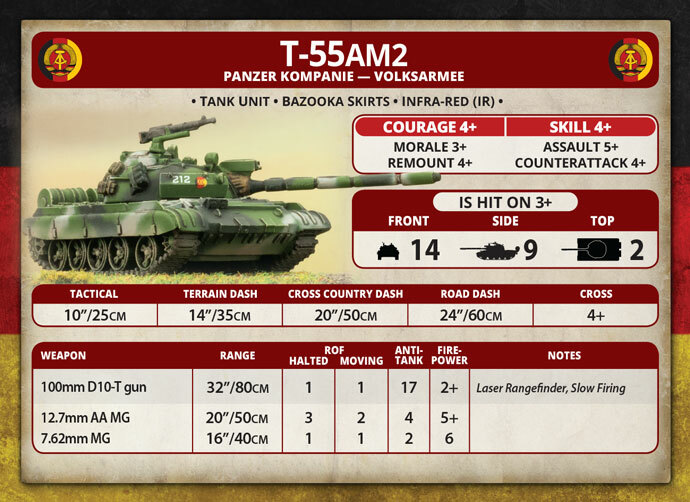 Lastly, (and sticking with the gun line on the unit card) the T-55AM2 picks up a Laser Rangefinder. This means that the modernised version doesn’t suffer a To Hit penalty for long range. 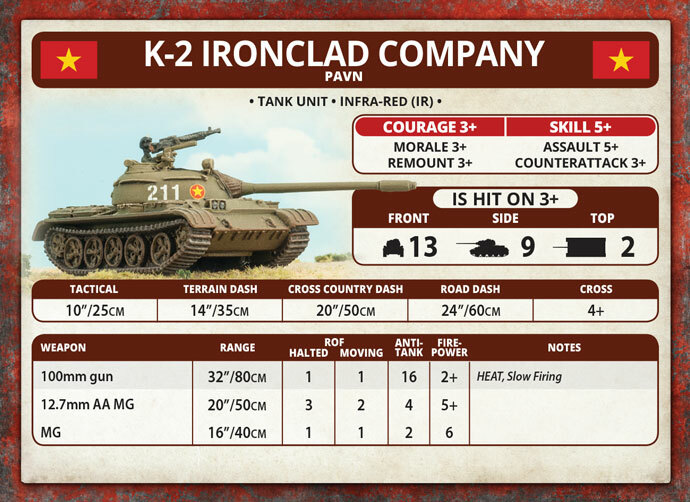 This may not give much of a benefit when shooting enemy main battle tanks where AT 17 won’t do much, but it does make them a little more reliable when shooting up support vehicles as your tanks push in to close range to attack the enemy armour. On the surface the T-55AM2 looks like a suboptimal choice as it cannot hurt most enemy tanks in a head to head duel. When guided missile carriers like the M901 ITV, Swingfire and Jaguar have missiles quite capable of knocking out a T-55AM2, and thanks to their higher To Hit number and the likelihood of firing from cover are less likely to be hit by any return fire, especially if the T-55AM2 is moving. Of course, one of the advantages of a wargame over reality is that no real-world battlefield commander wants to fight a battle where the odds are not in their favour, while games have a points system to balance everything out and so this is where the T-55AM2 (along with other older generation tanks like M60 and Leopard 1 tanks) can shine. A full strength East German T-55AM2 Panzer Company comes in at only 16 points, or 1.6 points per tank. This average points value actually drops quite notably when you look at the smaller platoon sizes . I won’t dive into the pros and cons of MSU because I don’t consider myself an expert on the theory but having found myself on the receiving end a number of times it is definitely an option as it is challenging for a force composed primarily of modern tanks (Abrams, Leopard 2, or Chieftain tanks) to kill enough before the T-55AM2 tanks start making their side shots count. For some people the acronym MSU will be something very new and depending on who you ask it means; Many Small Units, Multiple Small Units, Minimum Size Units, or something along these lines. The theory (in brief) is that a large number of relatively cheap units will overwhelm a defender’s ability to kill the attackers fast enough, resulting in the swarm killing the enemy, losing more models but less overall points. This one really comes down to you. Team Yankee has a very diverse and growing range of list theming options for players making the days of one true list to rule them all less likely. 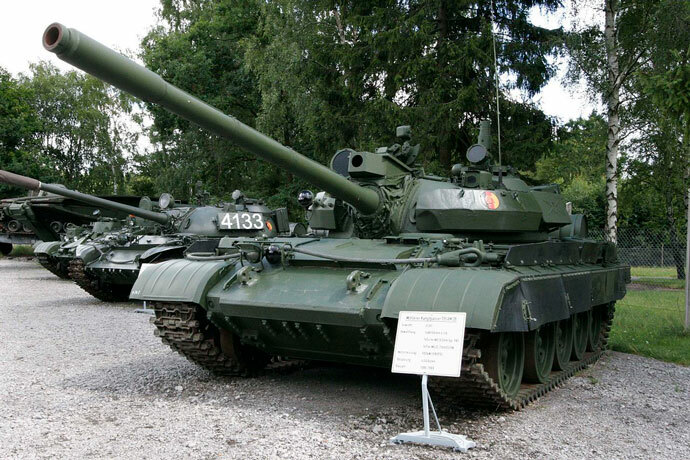 However, I suspect that there will always be a place for someone that wants to put 20-30 (or more) cheap T-55 tanks backed up by some Hinds, infantry in BMPs or BTRs and a few specialist assets on the battlefield. I know I’ve already started creating a stash of models for a future project once I have finished my Canadian Leopard 1 Company and French AMX-10RC Companies!